Accurate viewing depends on properly applying ICC color management using calibration hardware. 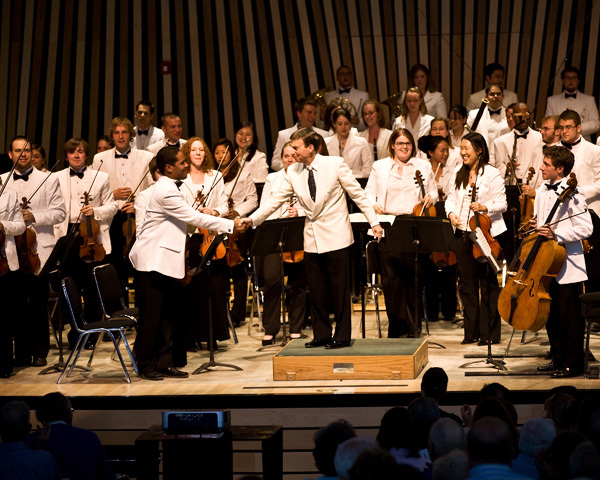 SUMMIT COUNTY – The National Repertory Orchestra, a local gem among nonprofits, not only creates educational opportunities for up-and-coming young musicians, it provides Summit County with top entertainment programs. With 52 years in Colorado, this musical organization is also one of the leading programs for producing classical stars of the future, said Julie Chandler, its director of development. NRO Board of Trustees member Barbara Calvin said she participates in the local program because she loves to work with young people – and music is her passion. Young adults, aged 18-28, are invited to apply for fellowships with the NRO every year. Founded in 1960 by Walter Charles as the Blue Jeans Symphony in Estes Park, the orchestra moved to Evergreen in 1966 and changed its name to the Colorado Philharmonic. In 1986, the orchestra relocated again to Keystone Resort and changed its name to the National Repertory Orchestra. And in 1993, the Town of Breckenridge invited the orchestra to perform in its Riverwalk Center -now the NRO’s official summer residence. The NRO performs two full orchestra concerts each week in Breck’s Riverwalk Center between mid-June and early-August. It also takes part in smaller, chamber concerts, and the full orchestra plays at various events throughout Vail, Dillon, Keystone, Copper, Silverthorne, Frisco, Evergreen and Denver. The National Repertory Orchestra acts as a “preeminent intensive fellowship that equips young musicians for orchestral music careers while providing the highest level of musical experience for all stakeholders,” said its website. During summer fellowships, NRO musicians take part in the nonprofit’s education and community engagement outreach programs, which prepares participants for active roles in the communities they’ll be serving. Career development classes – such as mock auditions, contract negotiations, finance for musicians, and training in music therapy and early childhood interaction – are also part of the NRO’s programming. Musicians also take part in community events throughout the summer, including performances at area preschools and hospice centers. And, for students accepted to the program, it’s essentially free. According to Board of Trustees member Barbara Calvin, housing is provided for NRO musicians along with $50 a week for food. “We need to raise about $8,000 per musician,” Chandler added. The NRO summer program also provides opportunities for locals to be actively involved with the visiting musicians. NRO musicians and interns are matched with local families to do weekly activities such as hiking, rafting trips, picnics and sports events. Community members can volunteer too for a plethora of support positions. “(The NRO) offers young musicians opportunities, but it also provides a cultural gem for locals and visitors of Summit County,” Chandler said.